This page comes to you from the Hotel Oberland, in the Mallasa suburb of La Paz, Bolivia. Since leaving Womble and Kon Tiki, we have walked on water, visited a boat shipped from England in 1000s of bits, seen cars being blessed, purchased holy water, taken a ferry across Lake Titicaca and visited Bolivia's premier archaeological site. Lake Titicaca is famous for being the highest navigable lake in the world, for reed boats and for inhabited man-made floating islands. Most of the group took a boat trip from Puno to visit two of the nearby floating Uros islands and see the traditional reed boats. Opinions varied about the authenticity of what was on show (the reed boats now incorporate hundreds of plastic Coke bottles for added buoyancy). Also on view in Puno is the MV Yavari. Built in England in 1862 and supplied to the Peruvian Navy in kit form (2766 pieces, none of them heavier than could be carried by a mule). After a six year journey it was reassembled on Lake Titicaca. 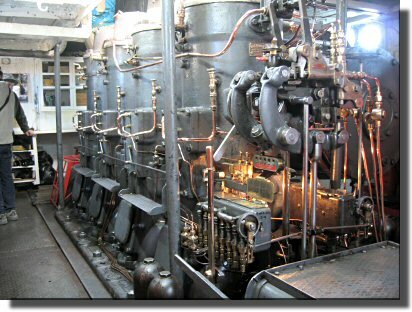 The original steam engine, fueled by llama dung, was replaced in 1914 with a Swedish "semi-diesel" engine. The Yavari was rescued from the scrap yard in 1987 and is still being restored. Now afloat and with the engines restored and working, it is intended to carry passengers on the lake in a few years. The crossing from Peru to Bolivia at San Pedro de Tiquina was reasonably straightforward, although we were only able to get permission to stay in Bolivia for 30 days rather than the 60 we wanted. Those with a good map will realise that the bit of Bolivia we crossed into is isolated from the rest of Bolivia by lake Titicaca. Our immediate target however was Copacabana, a lake-side town famous for blessing cars! Twice a day people bring their cars, busses, motorbikes etc. to the church where the local priest, wearing a baseball cap, blesses them and sprinkles them with holy water (available in one litre bottles for about $0.25 USA). 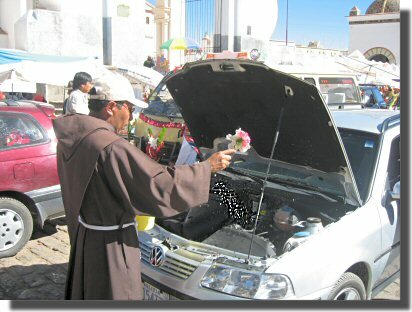 Not content with just a Christian blessing, most people then spray their vehicle with beer, sprinkle it and themselves with flower petals and for good measure get the local shaman to chant and burn leaves. Alas no research is available about the efficacy of these procedures. 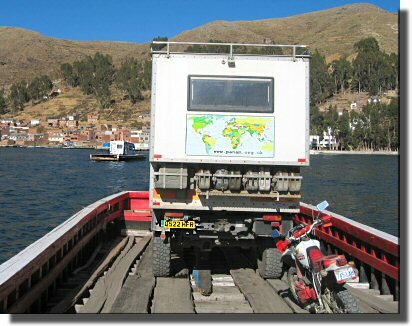 In order to get from Copacabana to the Bolivian mainland, we had to cross lake Titicaca from Tiquina to San Pablo. The many small ferries that ply this 500 metre crossing are "interesting". Each boat seems to be privately owned and very roughly built of wood with no proper deck, just strips of planks. Power is provided by an assortment of old outboard motors. Each boat takes only one vehicle and the "ramp" arrangement for boarding is best suited to trucks. Above: Note Mel on her own ferry to the left of Mog. Partly because Les recommended it so highly, and partly so we could drive into La Paz on a Sunday morning, we decided to visit Tiwanaku archaeological site and spend Saturday night there (The visitor centre car park is at S 16.558440 W 68.674625). The site may date back to 1600 BCE but the giant carved figures visible today are from around 900 CE. By far the most spectacular exhibits are in the new museum, where photography is prohibited. Entrance for foreigners is about $8.00USA. Whilst we were camped in the visitor centre car park, we were approached by a policeman who enquired about where we intended to go on Sunday. When we told him La Paz, he said that La Paz would be closed to all private vehicles for the whole of Sunday because of the election! So we spent a constructive Sunday rotating our wheels and changing our fuel filters (Mog), cleaning our fuel system, trying to sort out our charging system and re-connecting our water tank heater (K-Nine), and saving all our photos to CD (Mel). The Hotel Oberland, in the Mallasa suburb of La Paz, Bolivia. The Hotel Oberland (Phone: 591-2-2745040, 9392, calle El Agrario No 3118, Mallasa, La Paz) is a good place to stay in La Paz, but it is not a real overland vehicle camping place. 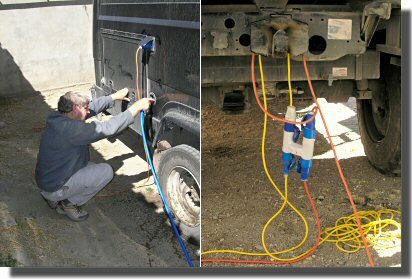 It is a hotel with a car park that overland vehicles, including commercial overland trucks, can use. The parking is secure and the hotel restaurant is good. There is WiFi Internet access, but there is no electrical supply, unless you have a 70 metre cable, and no water unless you have a 90 metre hose pipe! The hotel charges $3.00USA per person per night. Meals in the restaurant cost between $3.00 and $10.00USA. A taxi to or from La Paz (about 12km away) costs only $3.00. To get to the Hotel Oberland when heading North up Route-1 from Patacamaya, without going thru La Paz, you can turn right at the traffic lights at S 16.553834 W 68.179635 (about 7km from La Paz). After about 200 metres you will pass thru a double arch and on to a cobbled road. If you follow this cobbled road for 17km you will arrive within 200 metres of the Hotel Oberland without passing thru any of La Paz! The road is not in good condition and is very steep in places, but it has great views of the Moon Valley. This is the route we took when following a taxi from the Hotel Oberland heading South. 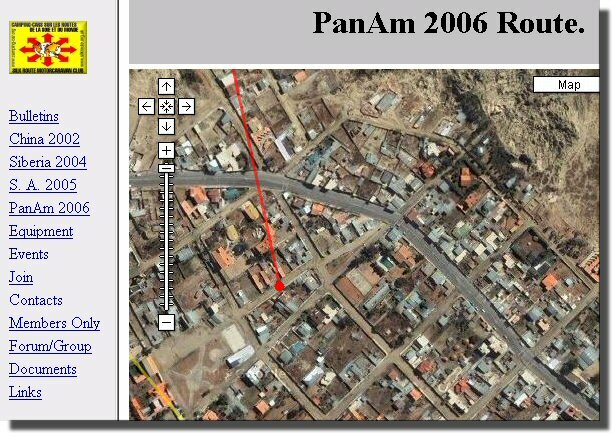 If you want to see where in South America we are you can use the Map link on the PanAm 2006 index page. You can then zoom in to see a detailed satellite image of our exact location. 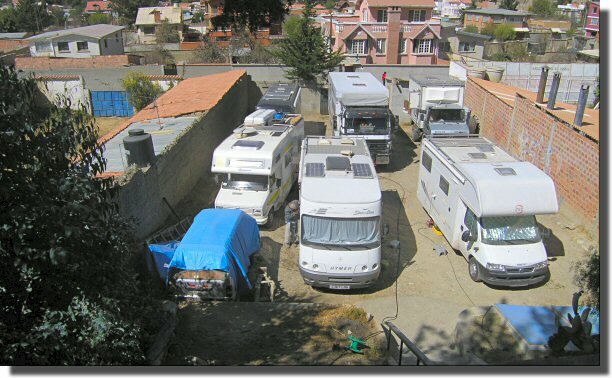 For example the image below is of our camp site in La Paz, Bolivia.